La Place du Tertre is a little square in the Montmartre District. 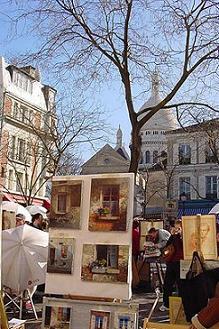 In the past Place du Tertre was a center for artists and painters. Picasso and the french painter Utrillo lived and worked here. 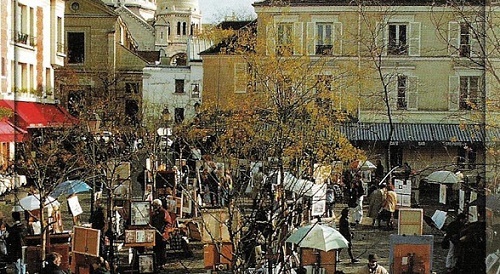 Nowadays the square is a favourite place for tourists worldwide. There are shops, terraces and painters at the square can make a portrait of you. Espace Dali (a museum of Dali with 300 pieces) is just around the corner. Properties around the square are expensive. The apartment Mansarde des Artistes is the one with the best location. The accommodation (up to 4 persons) is located AT the Place du Tertre. It has a kitchen with dishwasher and superb reviews (9.0). Three star Hôtel des Arts has discount prices + fabulous reviews (8.7). It’s a 10 minutes walk to the Place du Tertre, 100 metres to the nightclub Moulin Rouge and 350 metres to the metro.